New hanging dehumidifier. Helps prevent damp, mould, mildew and condensation. Absorbs up to 3 times it’s own weight in water. Activate by removing from pack. Integrated hanger for wardrobes. New hanging dehumidifier. Helps prevent damp, mould, mildew and condensation. Absorbs up to 3 times it’s own weight in water. Activate by removing from pack. Integrated hanger for wardrobes. Very light pleasant scented fragrance. 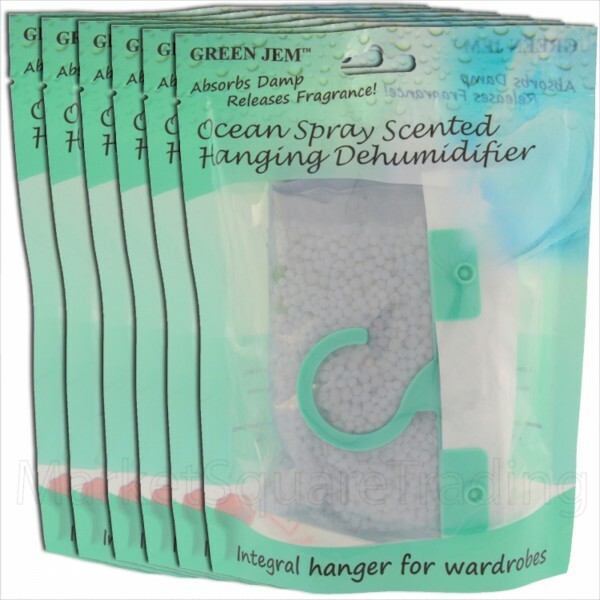 Leaves you wardrobe smelling fresh without overpowering your clothes. Draws in moisture from the air Prevents damp, mould and mildew. Ideal for those caravan winter lock ups. A quick & easy Way io help remove damp & improve air quality. The special crystals inside draw moisture from the surrounding atmosphere trapping it inside the dehumidifier packet. Specially designed to remove damp stale smells Reduces condensation and prevent mould & mildew building Up. The dehumidifier is really effective Under sinks and in caravans & boats in Winter months When damp is most prevalent. 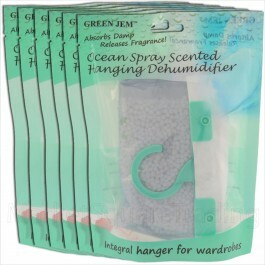 Yet Another Premium Quality Product From Green Jem. Please feel free to browse my other items for more lovely scents and pack sizes.